Following the disastrous decision by the autonomous Kurdistan region of Iraq to hold an independence referendum last year, relations between Arbil and the central government in Baghdad nearly collapsed. More than 92 per cent of the Kurdish population of Iraq backed secession, but Baghdad rejected the referendum as illegal, imposed economic penalties and seized the disputed Kirkuk oil fields, halting Kurdistan’s controversial oil exports. Major powers in Iraq’s neighbourhood — which are grappling with their own restive Kurdish minorities — also took a dim view of the vote. That said, last week signs emerged of an improvement in relations between Baghdad and Iraqi Kurdistan, with the visit of key Kurdish leader Masoud Barzani to Baghdad to meet the new Iraqi Prime Minister Adel Abdul Mahdi. This was Barzani’s first visit to the national capital in over two years. Abdul Mahdi said it’s very important to have good, smooth relations between Arbil and Baghdad and they have seen a huge improvement on all levels. This apparent rapprochement is in the interest of both sides, and the region at large. It also highlights the fact that the authorities in Iraqi Kurdistan are alive to the ground realities. They need to cherish the substantial autonomy their region already enjoys within a federal Iraq, without trying to provoke Baghdad with ill-advised moves. Baghdad’s furious reaction to the vote last year, and the support the federal government got from major nations in the region and beyond, underscored the importance of territorial integrity. In a region torn apart by conflict, it is crucial to bear in mind that break-up of nation-states along ethnic or religious lines will only create more instability and prompt other groups to seek a similar path. 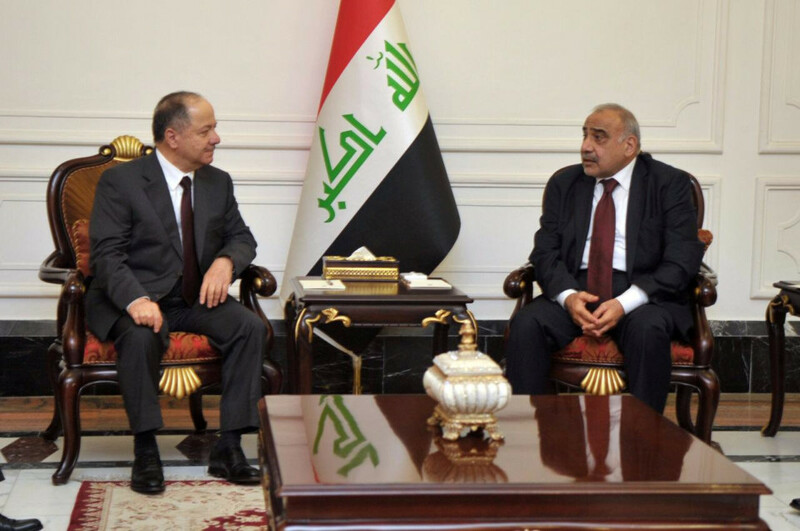 A key dynamic behind the new moves for closer cooperation between the two sides is the close relationship between Abdul Mahdi and the recently-elected (Kurdish) President of Iraq, Barham Salih. The men have known each other for years ever since the Abdul Mahdi served as representative for his party, the Supreme Council for the Islamic Revolution in Iraq, in Kurdistan back in the 1990s. Salih could emerge as the lynchpin in the relations between Arbil and Baghdad as he is acceptable to all sides in Iraq. He is expected to play a bigger role in resolving issues between the two parties.Iraq’s parliament in March passed a budget that saw Kurdistan’s slice of the federal budget drop from 17 per cent to 12.6 per cent. With the election of a moderate technocrat as premier in Baghdad, the Kurds have a new opening for resolving existing disputes. Barzani’s visit was a positive move, with discussions expected to be held on the lethargic government formation process in Iraq and the Kurdistan region’s share of the federal budget.